A PASSENGER DIED on a flight that was forced to divert to Shannon Airport yesterday evening. Air Canada flight AC-849 from London’s Heathrow Airport to Toronto in Canada diverted to the mid-west airport after the crew declared a medical emergency. The Boeing 777 jet was about 400 kilometers north-west of Mayo when the crew turned around. The flight rerouted to Shannon with cabin crew members battling to resuscitate the elderly woman. The flight landed safely at 5.15pm and was met by airport emergency services and National Ambulance Service paramedics. The woman was pronounced dead at the scene and the county coroner informed of the matter. The woman’s body was removed to University Hospital Limerick where a postmortem examination is expected to be carried out while efforts are also being made to repatriate the remains to Canada. 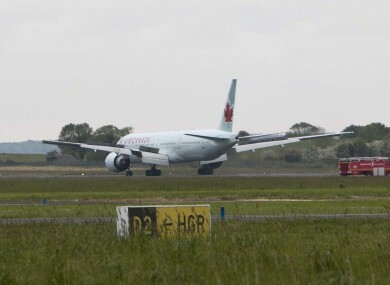 The flight continued its journey to Toronto about two hours after landing at Shannon. Last Monday, an 88-year-old man died after the Delta Air Lines flight on which he was travelling from Amsterdam to the US diverted to Shannon. Meanwhile, yesterday’s medical diversion was the second in a matter of hours at Shannon. Earlier, Austrian Airlines flight OS-93 made an unscheduled landing at the mid-west airport after the crew declared an emergency just north of Mayo. The crew reported they had a man on board whom they believed to have suffered a heart attack. The Boeing 767 jet landed safely at 12.30pm and was accompanied to the terminal by airport fire service vehicles where airport authorities and ambulance paramedics were waiting to board the aircraft. The passenger was assessed at the airport before being removed to hospital by ambulance. Email “Flight diverts to Shannon after a passenger dies on board ”. Feedback on “Flight diverts to Shannon after a passenger dies on board ”.